Builders’ sentiment dropped back to levels more consistent with the second half of 2015 after an upward bounce in October. The November NAHB/Wells Fargo Housing Market Index dropped three points from an upwardly revised October level to 62. The index has been above 60 since June 2015 and remains well above the tipping point of 50 where more builders see an improving market than see a poorer market. Two of the three components also fell back to the levels established in the summer. The current sales index dropped three points to 67 equaling the September level and better than June through August levels. The expectation for future sales dropped five points to 70, the same as July and August levels. The traffic component increased one point to 48, the highest level since October 2005. Builders continue to express concern about the lack of buildable lots in locations where buyers want to live and the very limited availability of construction labor crews. These supply constraints have limited builders’ bringing new homes into inventory. However, builders are seeing more potential buyers show up at their building sites, at the model homes and in the offices as consumers become more confident in the housing market and the overall economy. 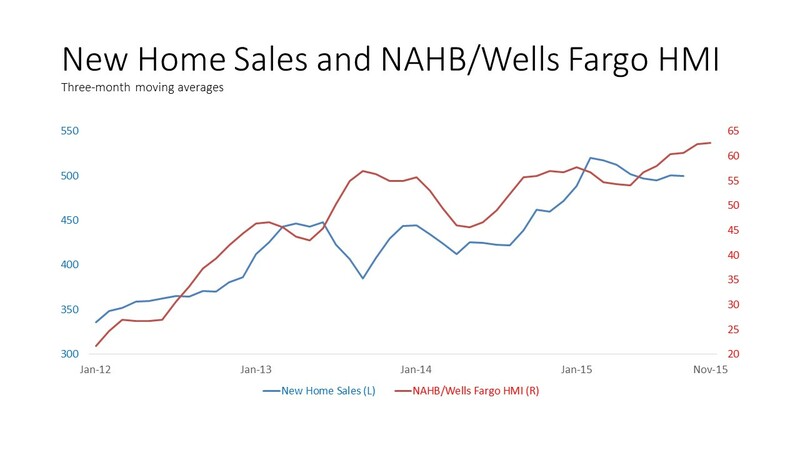 The NAHB/Wells Fargo HMI does appear to portend home sales turns. The graph shows an uptick in the three-month moving average of the HMI is followed in two or three months by an uptick in the three-month moving average of new home sales. ‹ How Many People Have Benefitted from the Affordable Housing Credit?